On the surface, you can see how Twin Peaks inspired Link’s Awakening by looking at the game’s characters—for every Log Lady there’s a Madam MeowMeow. But contextualizing Link’s Awakening’s place in the Zelda series more fully reveals its Twin Peaks-esque qualities. By the time the game came around, three other main Zelda entries had already been released, so Link and Hyrule had become familiar to players. What Link’s Awakening did, then, was transport Link to a parallel dimension with similar formalities—traverse this land and collect its treasures in a bid to rid it of its evils—but with different rules and assumptions operating its world. On Koholint Island, where the game takes place, you are as likely to see creatures hailing from the Mushroom Kingdom as you are to see ones from Hyrule. You’re no longer Link, home-grown savior; you are Link, shipwrecked and disoriented, making his way through an island unfamiliar to both you and The Legend of Zelda. The strangeness of Koholint Island points to another element that Link’s Awakening and Twin Peaks have in common: a surrealism that both texts achieve by playing with the divide between dreams and reality. In Twin Peaks, there are multiple layers of dream-like states. Broadly, there are supernatural forces that give reality itself a dream-like quality; and on top of that, there are moments that suggest that the townspeople themselves occasionally recognize the feverish absurdity of the world around them. (See Sheriff Harry S. Truman’s reaction to Albert’s “I love you, Sheriff Truman” monologue). Most significant, however, are the dreams themselves: Agent Cooper experiences multiple revelations related to his investigation through forays into a dreamscape of giants and dwarves and murder victims. Cooper’s ability to alter reality by navigating dreams essentially informs Link’s Awakening. Link, having been caught in a storm at sea, drifts to the shores of Koholint Island, which is in fact a place that exists only in the dreams of the Wind Fish, a mythical deity that rests within an egg on the island’s peaks. Link then undertakes an adventure to exorcise the nightmares that have infested the dream, which in turn allows the Wind Fish to awake. But when the Wind Fish wakes up, so too does Link—he had been unconscious all along, having somehow crossed over from his own dream into that of the Wind Fish. Koholint Island, now without a dream in need of shape, disappears. Dreams, as Koholint Island’s destruction and Link’s ensuing awakening exemplify, are not endpoints—they are means. They are catalysts that click things into place and induce the enlightenment of waking up, in the fashion of Plato’s Cave and modern ideas of wokeness. (Cooper attributes his enlightenment and “deductive technique” to a dream he had involving Tibet and the Dalai Lama—and how different is that from the droves of white people claiming wokeness, really?) It is telling that, rather than to “be” woke, the goal of the socially-aware is to “stay” woke. Understanding and influencing the interplay between abstractions—such as power structures—and the realities they concretely affect is a process, not an irreversible state of being. You can always fall back asleep. The Trump presidency has made it more and more difficult to retreat into a dream world in which America is an egalitarian exception to humankind’s self-destructive tendencies. While space in that imaginary has always been primarily reserved for the most vanilla of straight white men—centuries of the American project have made that clear—the bubble is bursting. 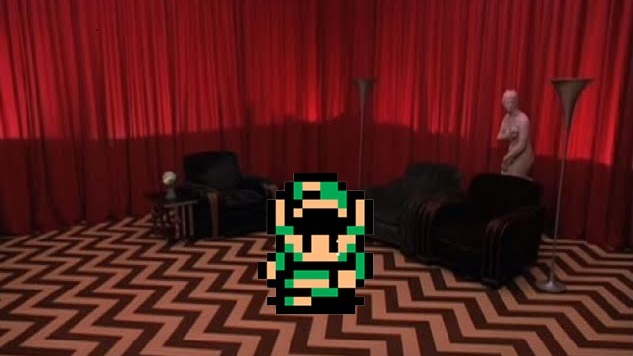 Trump has ripped apart the thin membrane between dreams and reality that Twin Peaks and Link’s Awakening blur. He is the boogeyman about which small towns and nations whisper. Fittingly, Twin Peaks is coming back. And The Legend of Zelda has kept up with the state of the world, as well. The series has long dealt with the apocalyptic, but its newest entry, Breath of the Wild, exposes players to a world on the brink of ending after having already crumbled. In doing so, the game evokes the dangers of thinking that the election of Trump is as bad as things can get. Breath of the Wild begins with Link waking up after having slumbered for 100 years, and Twin Peaks will return nearly 26 years after it ended with Agent Cooper trapped in the otherworldly Black Lodge. It may be comforting to believe that the increasingly-fantastical system of checks and balances will, like Link (and Cooper, hopefully), reawaken, and thereby deliver the world from its ongoing nightmare. But with each passing day, one thing is becoming clearer and clearer: Trump isn’t ushering us into a hellish dreamscape. He’s simply showing us that we’ve been dreaming all along. Niv M. Sultan writes about the socioeconomics of pop culture. You can follow him on Twitter.